The three most dangerous places in Iraq are Baghdad, Mosul, and Al Anbar province. While most of Iraq is functioning peacefully, a civil war sizzles and pops in these important areas. 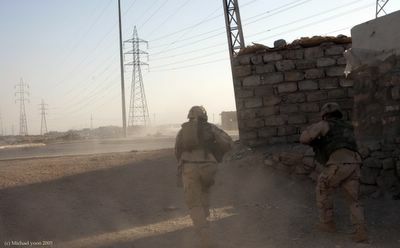 The key to long term stability in Iraq is the Iraqi Security Forces, which are comprised of the Police, Army, Navy, Border Police and similar organizations. From a ground’s eye perspective, the ISF progress is remarkable. 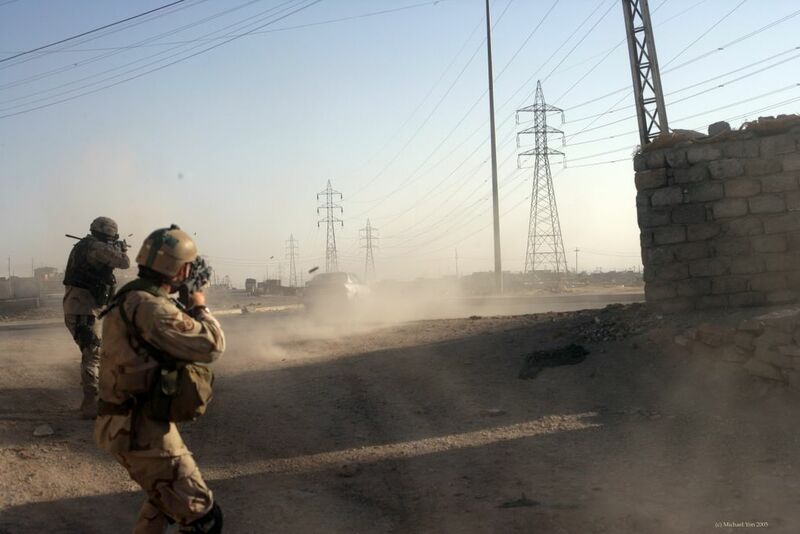 In Mosul, for instance, the ISF is fielding increasing personnel, and operations. Their success has had a few unanticipated consequences. US Army Captain Paul Carron recently reported that so many undercover police are operating in Mosul, that they have been arresting each other, sometimes accusing each other of possessing fake ID cards. Carrying any Government ID card is serious business. 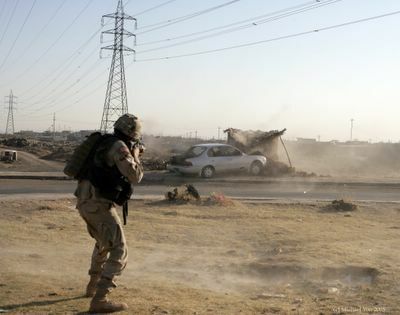 Just this morning, insurgents were randomly stopping cars searching for persons carrying government identification—people carrying such ID often are killed on the spot. We watched the live feed from overhead surveillance as Iraqi police swooped in on the insurgents. “Maybe they feelin’ froggy,” answered another. Near the edge of the base, a mushroom cloud was drifting away, and more black smoke began rising; a fire was born. The explosion had not been a nearby rocket, but a car bomb. The blast killed at least four Iraqi Policemen, and at least five civilians, including a 12 year-old kid, practically on our doorstep. The terrorists had attacked an Iraqi humanitarian convoy hauling assistance from Baghdad to Tal Afar, near the Syrian border. Such is daily life here, where progress is measured while the flesh and blood of the newly dead dries on the pavement. But that was Tuesday—a day of fighting—and I was in the middle of only a small part. Monday's happenings I followed with my boots on. The Iraqi Police are a main target for local terrorists who wish to squash freedom. But intelligence is the primary means to disrupting terrorists, and we knew they were planning to attack key police officers early Monday morning. So we planned to ambush the ambushers. Rolling out before sunrise, the initial fighting killed a taxi driver. The firing was brief and precise. A small amount of glass and glass-dust poofed into the air, and from what I saw, there is little doubt that the driver's death was sudden and painless. When he died at about 7:24 Monday morning, we knew that other known terrorists had been spooked. They were in two other cars at another known location. Within about thirty minutes, we loaded back onto the Strykers and rolled, and soon spotted a car matching the description, with two men in the front seat. The Strykers blocked in the car, and dropped ramps so the soldiers could dismount and check the suspects. Ramps down is always an interesting moment. One time, in another Stryker Battalion in Mosul, when the ramp dropped, bad guys started shooting into the back of the vehicle. More devastating, though, are the car bombs. People driving car bombs are known to explode without warning. But this car did not explode; instead, the terrorists tried to run the road block. This required them to squeeze between a Stryker and a building, nearly running over soldiers, who began firing at the fleeing insurgents. The terrorist were making a run for it. I followed behind with my new camera, and actually shot photos while running. But our guys shot them full of holes, and the terrorists crashed into a small roadside stand. Nobody had to yell, cease fire; These soldiers have fought enough to know when to start shooting, and when to stop. The two terrorists died at 8:04, Monday morning. The soldiers collected evidence, loaded the corpses into body bags, and were still searching for two other known terrorists. The four had moved into the area to link-up for a police-killing mission. 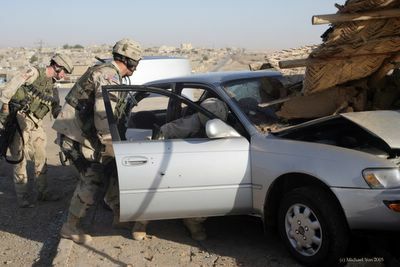 Within minutes, soldiers spotted the other car. The terrorists realized we were closing in, but not before soldiers were on them, disarming one of a pistol he had hidden under his dishdasha.. The two men were taken into custody without further violence. The time was 8:35 Monday morning.